Are you interested in having a smaller, more intimate wedding? Many couples choose the simplicity of an Elopement for their wedding celebration. If this type of ceremony experience is what you are looking for, I would love to work with you to create a beautiful, meaningful, and personal ceremony. 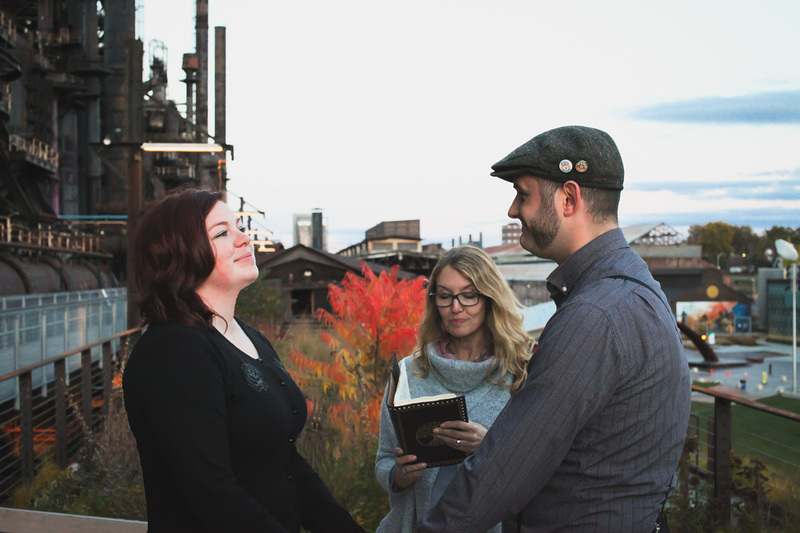 Writing your own vows, incorporating a special ritual, or adding unique elements, are some of the ways your intimate ceremony will create lasting memories. An Elopement is a ceremony that includes just the couple and perhaps a handful of guests. Fees vary depending on the details of the ceremony, location, and number of guests attending. The general range is from $375 - $500. 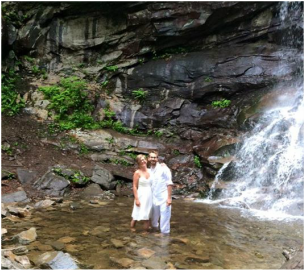 Looking for more Elopement details? Check out my website on all things Elopements! Would you prefer to get married in the comfort of your home with just a few loved ones? Perhaps you have children that you would like to include, and home is the best choice. Our Celebrants will craft a special elopement ceremony to reflect your love. James and Andrew's intimate holiday ceremony. Is there a location that is special to you? Our Celebrants will be happy to travel to your favorite place and officiate your wedding. Perhaps it is where you first met or where you popped the question? Give us a call and let us know what you are thinking! We love variety! Tara and Jayson under the waterfalls at Glen Onoko. The Lehigh Valley is home to some of the most beautiful outdoor venues in Pennsylvania. Do you have a favorite park? We can offer local suggestions such as the Allentown Rose Gardens and Haines Mill Park.Here are other Lehigh County Parks that make great choices for your special day. Lauren and Stephen at the Allentown Rose Gardens. Would you simply like to have your marriage license signed without the formalities of a ceremony? ​Certificate Signings are available in my Bethlehem home and can be scheduled both on weekdays and weekends. Contact me for availability. The fee for this service is $150 and includes ensuring that all legal marriage requirements are met including filing your license with the county courthouse. Elopements in Spanish, French or Greek! Would you prefer to have all or part of your ceremony in another language? The Lehigh Valley Celebrants provide all Elopement and Microwedding ceremonies in Spanish, French and Greek! Contact us to inquire about how we can work together to design a lovely Bilingual Elopement ceremony. See our Bilingual Ceremonies page for more information.